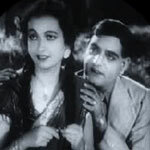 "Adhikar" is a 1938 hindi film which has Jamuna, Phari Sanyal, Menaka Devi, Barua, Pankaj Mullick, Jagdish Sethi, P C Barua, Rajalaxmi and Vikram Kapoor in lead roles. We have one song lyrics and one video song of Adhikar. Timir Baran has composed its music. Pahari Sanyal has sung these songs while Munshi Arzoo and Rasheed have penned its lyrics.